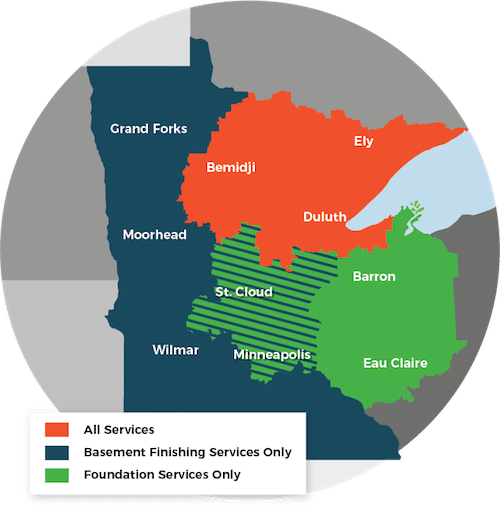 Even in a small town like Rush City, MN, foundation issues are still a problem. Look in your home for some of the signs of foundation failure or failure to come. Here are some examples of places to look from Rush City! Here in the crawl space where there are water issues is a sure sign of foundation problems. Water can eat away at your foundation and weaken it. This crack in the cement shows the movement of the soil and poor stability which can lead to further damage. Stair-step cracking in the walls is another sign of movement in the foundation. This needs to be stabilized before the wall becomes so unsteady and fails. Each of these examples shows common problems that people ignore. These problems should be taken care of while they are small so they do not become worse with time which can be more costly and cause more inconvenience. Don’t let your little problems turn into big ones!